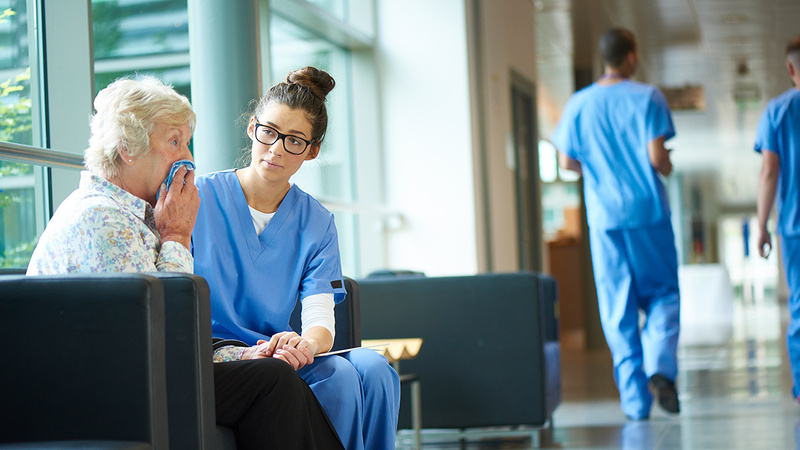 Nursing care at the end of life is a crucial aspect of supporting both the dying patient and their loved ones during a highly emotional process. This can be an especially confusing and worrisome time for families; thus, nurse-family communication could not be more important to achieving the best possible outcome in an admittedly difficult situation. Decades ago, most people died at home and the bodies of the deceased were often washed, dressed, and left lying in state for friends and family to pay their last respects. In 21st-century America, as well as many other industrialized countries, most patients die in the hospital, with a majority of families cut off from this medicalized dying process. During end-of-life care, family members’ interactions with healthcare staff must be seamless and clear, with the family feeling seen, heard, and unconditionally supported. With the rising recognition of the value of hospice and palliative care, more people are choosing to die at home, which puts families front and center in supporting their loved ones as they move towards death. This is where nurse-family communication becomes key. Fear, confusion, and anxiety are among the common feelings experienced by family members as they witness a loved one moving through the dying process. With many individuals having never witnessed death or seen a dead body, questions require clear and concise answers. The nurse interacting with the family of a dying patient must practice stellar communication skills. Listening is the keystone of nurse-family communication; for families of a dying patient, having the opportunity to speak honestly about their fears is truly a gift that can significantly decrease anxiety while preparing for the inevitable. Sensitive and timely conversations can address anticipatory grief and provide supportive counseling as families prepare for post-death bereavement. Families feeling seen and heard can be achieved by the nurse using high-level listening skills, receptive body language, and verbally paraphrasing what the speaker has said so that they know their words are being accurately received. The nurse’s ability to maintain eye contact and demonstrate caring and compassion is essential for loved ones to feel supported and acknowledged. The nurse providing end-of-life care must be willing to have difficult conversations. The dying individual can become quite uncomfortable at times, and family members must be clearly and honestly educated about what to expect and the actions they can take in response to various symptoms. If the nurse chooses to sugar-coat or downplay the dying process, families are poorly served. The nurse must be comfortable with his or her own feelings about death and dying so that their emotions are not projected onto the family seeking support. When family members need answers, the nurse must allow honesty and clarity to be guiding principles. Skillfully delivered information can soften feelings of fear, anxiety, and confusion, thus it is the nurse’s responsibility to consistently bring clarity and compassionate frankness to every conversation. Obviously, the nurse must be sensitive to family members of different ages, cultural backgrounds, beliefs, and religious and spiritual practices. While communication should be clear and concise, careful navigation of such differences should be top of mind. In the end, nothing is taboo when it comes to nurse-family conversations at the end of life. Death is often ignored and locked away in our culture, and the nurse’s job is to demystify death and dying by opening lines of communication, listening carefully, providing needed education, and bringing high-level emotional and relational intelligence to the table. As highly respected professionals to whom the public looks for guidance, nurses have a golden opportunity to lead anxious loved ones through the often intimidating labyrinth of death and dying. Supporting the dying individual and their family is a privilege and honor for nurses willing to be midwives to those most needing a nurse’s touch through life’s final transition.